The biggest viral hit on Kijiji since the ugly French couch was all people could talk about today on Twitter. Moncton resident Weh Ming Cho crafted an ad that's a little longer than your typical Kijiji fare, but has captured the attention of thousands. Tens of thousands. Hell, at this exact moment, 130-thousand. If you missed it in our last post, see the 11HP/29" Snowblower ad here. I knew I just had to talk to this guy. With a bit of help from other Twitter allies (lookin' at you, @HfxGirl), I got Mr. Cho on the line ... and here's how it went. It's only right to plug his blog, The Blognostifier: http://blognostifier.blogspot.com/, where he's chronicling the unfolding drama. 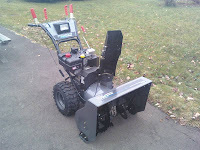 Weh-Ming Cho recently stirred up a flurry selling his east coast snow blowing menace. I have a west coast reply to his ad and a better idea - buy this magic golden doorknob and ditch your stinking, noisy snowblower relationship for one with this property. This doorknob faithfully, keeps several months of snotty slush and eye-lash seizing cold at bay. Divorce your snowblower, save the snow and ice for the polar bears and ride your Tauntaun west to Errington lotus land while there’s still space. This doorknob will open a portal to paradise - kick back and enjoy your beer on your green lawn in your shirt sleeves with the barbecue on. Take a deep breath and inhale in the pure air devoid of snowblower fumes, but scented with flowers and enjoy the marked absence of snowblowing racket. Review your heating bills and flaunt them to your ex-snowblower. The true path to ecstasy heads west. Lounge on the beach or enjoy the vibrant forest of giant mossy trees and amazing waterfalls. Nature’s at your door step and city amenities are within easy reach, including a university, huge library system, sports complexes, airport and a space-time portal. This paradise home is 2700 sqft, with two levels, cloud 8 and 9. There are three bedrooms with walk-in closets so big, you might land in Narnia if you crawl under the coat rack. Then there is an office so you can email photos of you sunbathing on Christmas day. There is an upstairs sitting room so you can watch the eastern snowstorms on TV, or listen to the radio report while soaking in one of the two tubs. There is a spacious cathedral ceiling living room so that you can put on a cozy fire and pretend its snowing outside. Invite your relatives from the Hoth ice planet to stay in the cute 720 sqft cottage (log post and beam inside, pottery sink, claw foot tub) or rent it. In the Garden of Eden, the trees grow like fur so you can’t see your neighbours and they’re all nice so you wouldn’t want to murder them even if they did have a snowblower. When you touch the door knob, you enter a time warp and arrive at a community where neighbours still look out for each other - in fact there is a “Hi Neighbour Day” and quirky parade. At the Christmas concert you can watch 16mm films like “The Snowman” accompanied by the local choir. Flip your phone to Moncton weather and gloat over the snowblowing craziness. Don’t marry your snowblower and let it pull you around - I hear they bite if you try to kiss them. Show who’s boss and buy this door knob (magic limited to its existing location.) BUY IT and never whine about winter again! Don’t be a snowblowing knob. Save the snow before it goes extinct! Go ahead ...turn the knob and enter nirvana. P.S. Do you really want snow? Head to the mountain where 16 meters of snow smothers small chalets. Spend your time playing in it, not blowing it around.